2009 | Ain't I A Woman?! "Workers Win Subcontractor Case" by Matthew Lynch of Women's Wear Daily 2009 Feb 13. 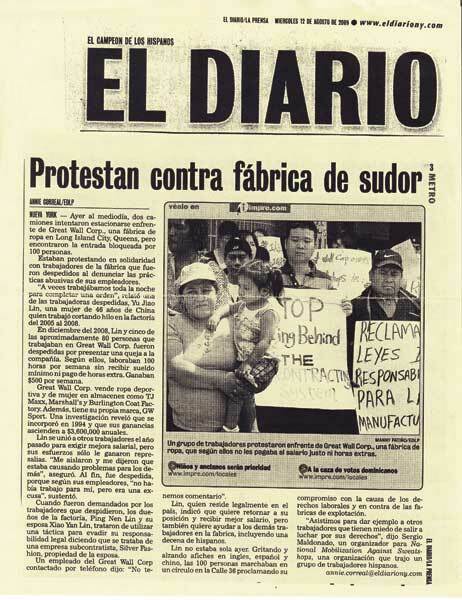 "Protestan Contra Fabrica de Sudor" by Annie Correal for El Diario 2009 Aug 12. "Scores Protest Sweatshop Conditions" by Willow Belden for Queens Chronicle 2009 Aug 13.